Rajasthan is one of the 28 states of India. Located in the north-west, it shares its borders with the Indian states—Punjab, Haryana, Uttar Pradesh, Madhya Pradesh and Gujrat. It is believed that long time back when Lord Rama (heroic figure in Hindu Mythology) was about to fire an arrow towards Lanka where his consort Sita was imprisoned by the demon king Ravana, other heavenly deities requested him not to do so. But once the arrow was drawn, it could not be taken back so Lord Rama released the arrow at a distant sea. And the sea dried up and from it rose the great Indian Thar Desert. 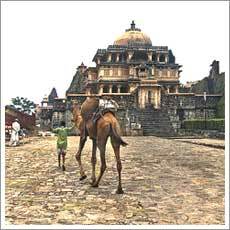 According to archaeological reports, the glorious history of settlement in Rajasthan goes back to Indus Valley Civilisation (2500 BC). Soon the civilization declined due to several believed factors like earthquake and invasions. Later the barren land of Rajasthan started becoming civilised and the main reason was a trade link between Europe and Asia. The period of 2000 BC saw the arrival of Aryans. Dundhmer region was occupied by them. The first dwellers here were the Bhil and the Mina tribes who gave birth to small kingdoms who fought with each other. Then Maurya dynasty retained its supremacy till 400 AD. One of the great Monarchs of this dynasty was Ashoka who after seeing the horrible wrath of war left everything and took faith in Buddhism. The Guptas ruled in the 4th century for 300 years. One after the other, Rajasthan was ruled by several Monarchs; most talked about were the Rajputs. They exercised the sovereign power in Rajasthan from 7th century AD onwards. They were known for their bravery and chivalry. They form an important part of the history of the state. The internal disputes between the Rajputs resulted in many battles that gave birth to several kingdoms. Finally the royal clans of Rajput reached an astonishing figure of 36. Since then Rajasthan has been called the land of Rajputs. The term 'Rajput' literally means the son of a king. The Muslim rulers became predominant in 1200 AD. Babar was the founder of the Mughal Empire. The Rajputs revolted against the Mughal rule. To bring Rajputs into the empire, the clever Mughal Emperor Akbar started forming matrimonial alliances with Rajputs. One of his extremely beautiful queen was Jodha Bai who herself was a Rajput. The brave Rana Pratap kept resisting the Mughal rule and waged Haldighati battle against them. But he was defeated. When the defeat of the Rajput rulers forced them to surrender their kingdoms, the royal Rajput ladies chose to finish their lives by jumping into the fire rather than getting exploited by the Muslim rulers. Marathas came after the decline of Mughals in 1707. It is said that they were not honourable in their principles; as a result the common people suffered a lot. And finally the British rule was established in 1817 which ended after a long spell of years. After much awaited Independence, the princely states of the scattered Rajasthan were finally combined together to form one single state named Rajasthan. Jaipur was declared its capital city. Today the state plays an important role in the economy of India and is one of the most widely visited destinations. It is a proud land of countless palaces and havelis which were left as heritage by the erstwhile Rulers.